Odile Disch-Bhadkamkar of Palo Alto, California, has over two decades of experience in higher education finance. She is emeritus managing director and chief financial officer, Stanford Management Company, where she oversaw investment operations, reporting, compliance, information technology and participated in the investment process for the endowment. 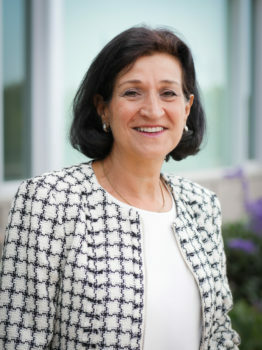 During her tenure at Stanford, Disch-Bhadkamkar was treasurer and led public debt offerings, oversaw the university’s debt portfolio and managed cash operations. In addition, she served on the investment committee for the university’s retirement plans. Prior to joining Stanford, she was vice president at JP Morgan, advising technology companies on financing strategies. She currently serves as trustee for Grinnell College, is a member of Stanford’s department of athletics advisory board, and has served on the board of the California Educational Facilities Authority. She holds an MPA from the Kennedy School at Harvard and an ALB from Harvard University Extension School.